Glass balls & bell deco 4-pc. 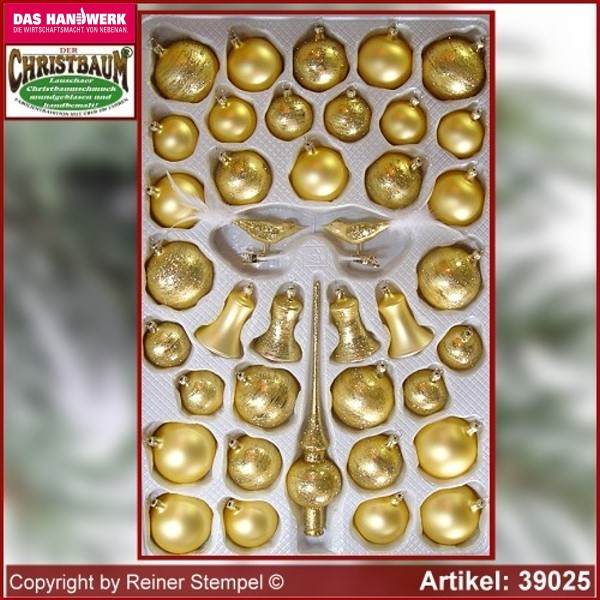 Main page » Christmas tree ornaments » Assortments 39-pc. » Christmas tree decorations 39-piece assortment "Eleganz"
Christmas tree decorations 39-piece assortment "Eleganz"
Gold satin colored balls made of glass gauzy painted with fine dust (Glitter). So is this christmas tree a timeless beauty and with a variety of Accecoires individually combined. This christmas tree ornaments, calls back us of the sunny days in remind, with her warmth and comfort. TIP - Very good to combine with our series "Mystic red" or even quite lush with angels and cherubs. Trademark Lauschaer Glaskunst ®, made by hand: (blown off the lamp, hand shaped, hand painted). Sungold satin with gold tinsel. Please contact us and let us know your questions, suggestions and opinions knowledge. We think about over the answers and report to as soon as possible, by telephone or via e-mail. Try it - we're sure: it's worth a try!